When the gardening in Texas book says plant in full sun it should have a disclaimer – Plan to remove your dead plants by mid-June. You can take your chances and plant early but you risk losing your whole garden to a late frost. Or you can watch your baby plants, like we did, get mangled by a spring hail storm. The bottom line is if you want a sustained supply of whole, organic foods you will probably have to buy them. We planted beans, squash, tomatoes, okra, peppers, and cucumbers this spring. After a significant late frost in May the plants recovered but only to be flattened by a hail storm. Still our plants limped along trying to produce when the weather turned cool and rainy in early June. We were so excited as fruit actually began to appear. Then mid-June the heat set in. We watched our organic garden struggle. First the beans got eaten by grasshoppers, then the ants got the okra. The squash died of unknown causes (I think it just gave up hope). The tomatoes got hit with horn worms. We actually got about 10 cucumbers before the plants just turned yellow. We cut them back and now they are getting a few green leaves back. The peppers that are in almost full shade are doing OK. Despite a disappointing season we have learned a few things. First, soil is critical. We worked hard to make our soil fertile but our caliche base is hard to work with. We did better with the raised beds we filled with organic soil from Geo Growers. We found that the pH of the soil is critical. Some plants like more acid soil so we added coffee grounds and cedar mulch around those. Individual minerals are also important. Our peppers needed lots of extra magnesium. Epson salts worked into the soil worked well for this. Alfalfa leaf mulch around the tomatoes seemed to help them. Insect control was a real challenge for our organic garden. Self-rising flour around the base of the tomato plants took care of the horn worms. So far we have not found anything to fight the ants (nematodes helped a little) or grasshoppers so our goal next year is to plant enough to share with them. We believe in the need for whole foods that are not genetically modified or full of chemicals. We want to grow our own but we have a lot to learn. We ended up with some nice pepper plants that are yielding well. 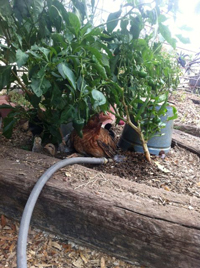 The chickens are happy to have a little something green to nibble on and a cool, wet place to hang out. Next year we will do better but in the mean time we continue to supplement with nutrient dense whole foods that you can see here.